Time for listening to crickets chirp, swimming in sparkling lakes, and daydreaming. Time for picking berries, eating a picnic lunch at the park, and running through the backyard sprinkler. Time for making mud pies, chasing after the ice cream truck, and exploring in the woods. Time for playing kickball in the neighborhood, catching fireflies, and lying on the grass counting stars. Summertime gives our kids the time for all of these things and more. Summer should also be a time for learning. 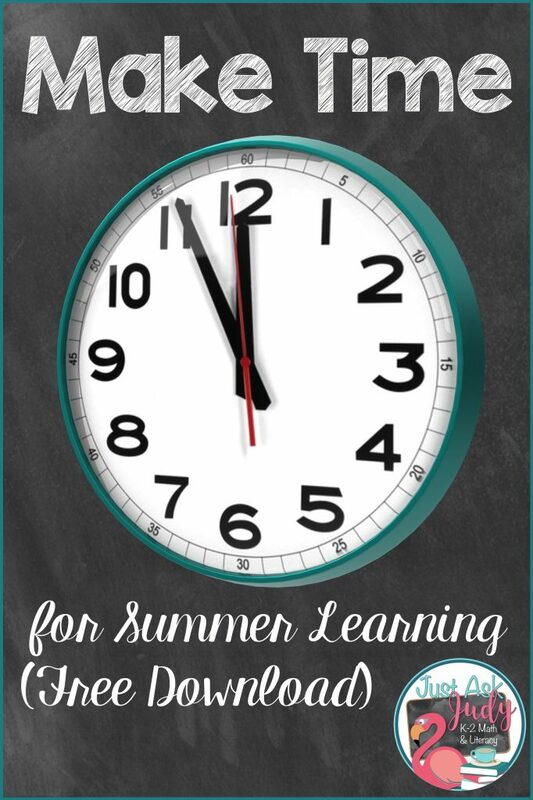 Summer learning loss is a real phenomenon that unfortunately, accumulates over time. Summer learning loss in math is typically greater than reading (Why Summer Learning). Surprisingly, reading as few as four to five books over the summer can prevent this loss in reading (Do Kids Really Have “Summer Learning Loss”?). Whether it occurs at home or through school and community-based programs, summer learning can be critical for academic success. The recommendation for integrating academic learning with hands-on and enrichment activities resonates with me. I love the idea of encouraging kids to read a plethora of materials, with different people, in unique ways, and in a variety of places. If you love this idea too, you’ll want to click on these links for free resources. Math can easily be incorporated into everyday activities. You’ll find suggestions in these articles to get you started. Education World’s suggestion for keeping a record of bedtimes and rising times lends itself to not only telling time but also determining elapsed time and graphing data. I have a free telling time (what a surprise!) to the hour and half-hour bug themed resource to share. 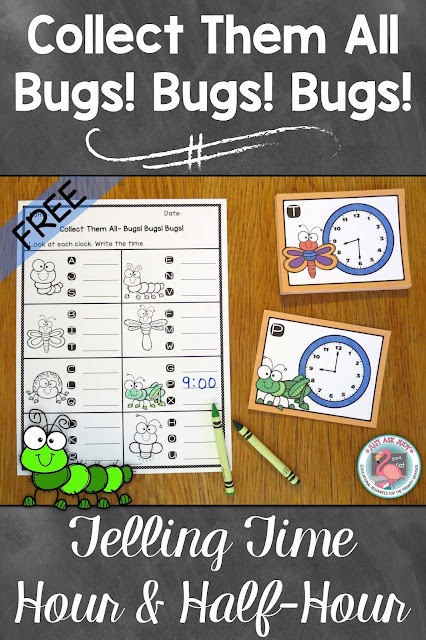 This is an engaging task card activity with a twist that is perfect for first-grade practice or review. It is designed for use with small groups (2-4 students) but could be completed by an individual. There is a set of 24 task cards that includes three copies of eight different bug images. Students pick a card and find the matching image on their recording sheet. They find the matching letter and write the time. Who can be the first to collect all eight bugs? 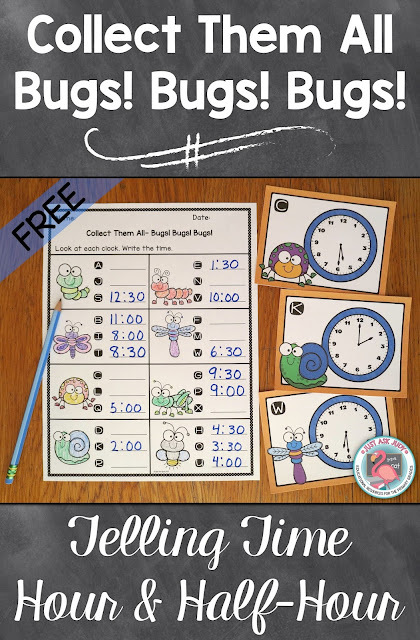 A color set of the telling time task cards along with a recording sheet and answer key is available as a free download from my Teacher’s Pay Teacher’s store. The recording sheet has a line without a colon for writing the time. A black/ gray/ white set of the telling time task cards is available as a separate download. This set also includes a recording sheet with the colon already given. It also has an answer key in red. Simply print, laminate (if desired), and cut the task cards. I use cardstock for durability. You will need one set for each small group. Print a recording sheet for each student and an answer key for each group. Each student will also need a pencil and crayons. Shuffle the task cards and place in a pile. For this activity, you’ll want a well-shuffled deck. Students take turns drawing the top card and writing the time on their recording sheet. The first time the image is matched, the student colors (or marks in some fashion) the image on the recording sheet. You may want them to underline or circle the image and only color after completion of the activity. Create a “discard” pile and reshuffle the cards as needed. The activity continues until one student has colored (collected) all eight different images or for a less competitive version until all students have colored each image. Students can use the answer key to check their responses, after each round or after completion of the activity. Be sure to check out the other task card sets in my Collect Them All series. There are four different summer themed sets currently available. 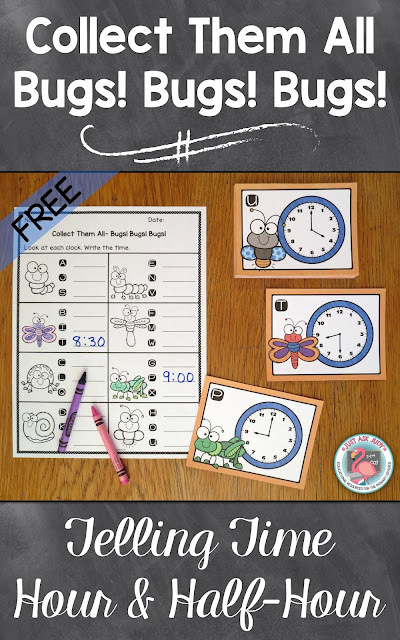 Click here for your free color telling time task cards. 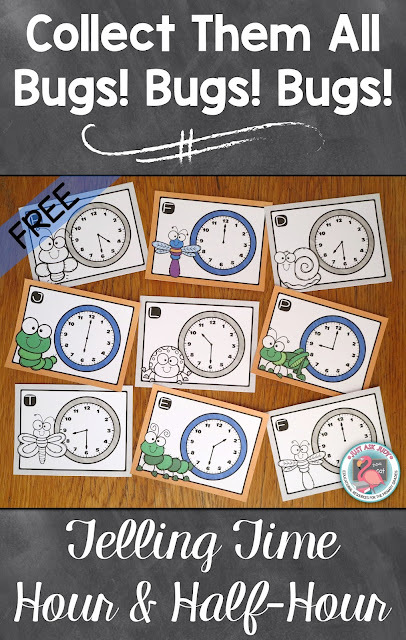 Click here for your free black/ gray/ white telling time task cards. Find more ideas and resources for summer learning (and fun) on my Pinterest board.